Welcome to Red Wing, one of the most unique and charming places to visit along the Mississippi River. From our beautiful bluffs, abundance of outdoor activities, historic sites and world famous boots and pottery, Red Wing offers a one-of-a-kind getaway. 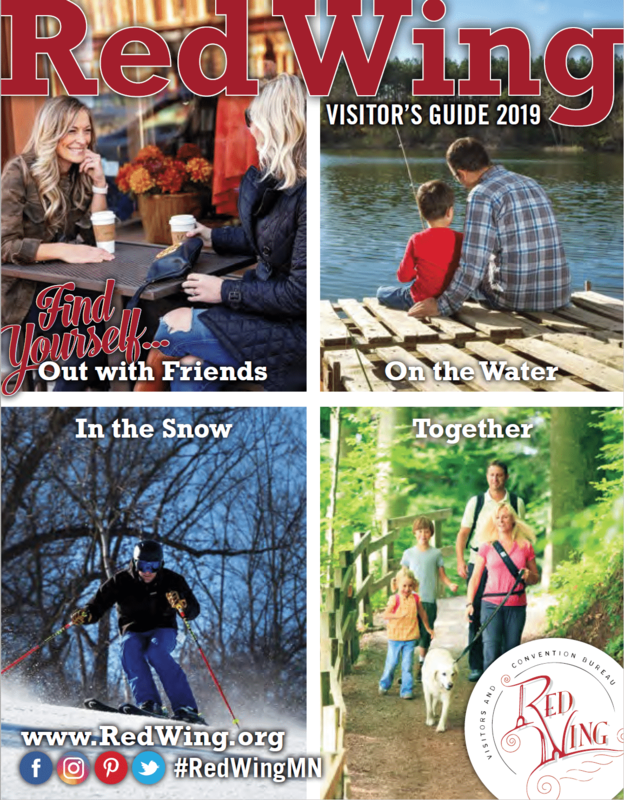 Whether you choose to hike Barn Bluff, bike the Cannon Valley Trail, picnic on Memorial Bluff, visit our wineries and brewery, play golf, dine in our restaurants, or shop in one of our many locally owned antique stores, art galleries or boutique shops, you’re sure to enjoy your visit. Treat yourself to a getaway and be surrounded by natural beauty, historic sites and unique small town character. Visit Red Wing’s premiere destination for fine arts and contemporary crafts from over 100 local and regional artists. Find us in the historic train depot right on the Mississippi! Visit the flagship Red Wing Shoe Store to see the world’s largest boot, Red Wing Shoe Museum showcasing the 100+ year history of the Red Wing Shoe Company, and full-floor outlet center. Store hours: Mon-Fri 9am-8pm, Sat 9am-6pm, Sun 11am-5pm. Built in 1904, this historic performing arts theatre showcases music, dance, theatre, and children’s performances throughout the year. Box office open Wednesday 1PM – 6PM, and Thursday – Saturday 12:30PM – 5PM. For event listings and 24/7 online ticket sales, please visit our website. Treasure Island Resort & Casino continues to expand their resort into an all-around, one-stop experience that is sure to impress you and your family. Aside from their expansive casino floor and new Lagoon Water Park experience, The Island also provides an array of restaurant choices, a luxurious Wave Spa, a bowling alley, arcade, and one of their biggest amenities – live entertainment! Established in 1869, Goodhue County Historical Society is the first historical society in Minnesota. Visitors can find exhibits, a full-service research library, and enjoy programs detailing Goodhue County’s rich and vibrant history. Open Tuesday through Saturday 9am-5pm and Sunday 12-4pm from May through October. Winter hours are Tuesday through Friday 9am-5pm and Saturdays 9am-3pm from November through April. Closed Mondays and holidays throughout the year. A national registered landmark, the Anderson Center’s facility houses a permanent art collection, sculpture garden, studio artists, classes, and retreats. With its International Artist-in-Residence program, permanent art collection, exhibitions, classes, and outdoor sculpture garden. Preserving the history of the clay industries in Red Wing, this museum has more than 6.000 historic pieces of stoneware, art pottery, dinnerware, and fold art to view and enjoy. Come check out our beautiful gift store and take your photo by the world’s largest jugs! Open 9am-5pm Tuesday-Saturday, 11am-4pm Sunday, closed Mondays. Follow us on Facebook! One of the largest ski and snowboard destinations in the Midwest, Welch Village has two chalets, 10 chairlifts, Skilink Performance and Learning Center, and 60 trails overlooking the Cannon River Valley. The Cannon Valley Trail runs 19.7 miles from Red Wing to Cannon Falls and attracts close to 100,000 visitors annually. The trail includes natural and cultural resources, scenic view sheds, rest areas, cross-country skiing, hiking, biking, and in-line skating. Wheel Pass required. He Mni Can – Barn Bluff, a true city landmark, is home to several different trails and a scenic overlook that is sure to excite any adventure seekers. The bluff extends along the Mississippi and provides trail options for all age groups and skill levels. Memorial Park allows visitors to take the trek up the bluff to experience a view like no other. From picnic tables and charcoal grills to a 9-hole disc golf course, there are many different ways for you to enjoy your time at the park. There’s something for everyone at Hobgoblin: Peruse our antique instrument museum. Visit our workshop and watch Stoney End folk harps being made. Enjoy a live performance in our music loft or even host an event. Sales of Celtic instruments, books, accessories, and more. See the website for more information and events. Red Wing pottery has been an American tradition for over a century. Today, we carry on the iconic legacy producing a variety of traditional as well as contemporary pieces. Weekday factory tours at 1pm, group tours welcome by appointment. Retail store open daily, Mon-Sat 9am-5pm, Sun 10am-4pm (Sunday seasonal). Great food in a great atmosphere; that’s what you’ll find as you explore the abundant dining options in Red Wing. Discover options that are quick and inexpensive, as well as full service and luxurious dining experiences at award-winning restaurants. Quench your thirst at the many bars, the Brewery, and wineries. Relax on the outdoor patios or in the cozy spots throughout town. Experience the many family-run options with hometown cooking and warm hospitality. The food scene in Red Wing will not leave you hungry! As you stroll through our historic downtown, Pottery District and explore the surrounding area, you will find a combination of unique, locally owned shops and world-famous brands that started right here in Red Wing. Our family owned shops feature high quality goods and services with local flair. Shopkeepers are happy to share the stories behind their products and strive to make your visit enjoyable. The Red Wing Area Farmers’ Markets regularly include locally-grown food, fresh bakery and artisan craft vendors, live music, and activities for kids. In the summer, the Farmers’ Market sets up shop outside the historic Depot on Saturdays from 8am-1pm. During the week, you can find trucks parked outside City Hall on 4th and Bush Streets. After October, the Farmers’ Market moves indoors at the St. James Hotel Mississippi Room during November and December. The AmericInn is conveniently located in the beautiful, historic river town of Red Wing. Restaurants and shops are within walking distance, including Pottery Museum of Red Wing and the Pottery Place Mall. The Cannon Valley Bike Trail is just a few short blocks from the hotel. Enjoy daily continental breakfast! Experience our recently restored B&B with historic old world charm, where new memories are awaiting you. Steps from downtown and views of Barn Bluff. Experience romantic, old-fashioned creative décor with a casual attitude at our recently restored Bed & Breakfast. Built in 1876, our Inn gives guests an historic old-world charm, plus a convenient location just steps away from Red Wing’s historic downtown district. Located in downtown Red Wing with 67 guestrooms, 14 meeting rooms, a coffee shop, 3 restaurants, several shops, and a spa on-site, your stay will be an escape you won’t soon forget. As a member of the Historic Hotels of America, the St. James was built in 1875 and still proudly maintains its 19th century character today. Step back in time at our elegant Victorian Bed and Breakfast. Originally built in 1877 by the manager of the Red Wing Stoneware Company, this Inn continues the tradition of elegant Victorian décor. Step back in time in one of our five large bedrooms, all with fireplaces, and private baths. Relax in a whirlpool, enjoy the large screened-in porch, and delight in a lavish breakfast. Multiply the excitement at Treasure Island Resort & Casino! Thousands of slots, live poker, bingo, blackjack, a luxury hotel, golf, river cruises, bowling, delightful dining options, and more, 24-hours a day, seven days a week, 365 days a year! Conveniently located near many local businesses, area attractions and trails, BW Rivertown offers deluxe leisure and whirlpool rooms, swim-through indoor/outdoor pool, fitness center, free wifi and cable. Free enhanced continental breakfast with every stay. Tour buses welcome! The Nichols Inn in Red Wing is within walking distance of the Pottery Shopping District specialty shops and restaurants. The Cannon Valley Bike Trail is easily accessed with a quick ride down the street. Fresh waffles are a favorite in our continental breakfast. High speed fiber optic internet is complimentary. Located off of Highway 61, the Country Inn & Suites offers guest rooms and suites with flat screen TVs, microwaves and refrigerators. We also offer an indoor pool, whirlpool, fitness center, complimentary wireless internet access, and complimentary hot breakfast daily. Indoor pool, whirlpool, free continental breakfast, high-speed wireless internet, family suites available. Family-owned motel located in a peaceful pine setting. Major credit cards accepted. Free local calls, cable TV, HBO, wireless internet, and microwave/refrigerator in every room. Large family unit available. Enjoy the beauty of Southeast Minnesota, stay at the Rodeway Inn in Red Wing. Just minutes from Historic Downtown and the Cannon Valley Trail. After a full day of travel, relax with amenities like a heated indoor pool, hot tub, free breakfast, and WiFi. High-speed wireless internet, cable, and microwave/refrigerator in every room. Indoor pool & whirlpool, whirlpool suites, and free continental breakfast. Restaurants within walking distance. A historic and comfortable B&B in the heart of Red Wing, MN. All guest rooms feature private baths with two-person whirlpools. A delicious, fresh-made breakfast is served each day. A great wedding venue. Just across the river in Hager City, WI. Book or message us online! Offering a retreat for 2-12 people, this charming vacation rental is located just across the river from Red Wing. Spectacular views of the water and the bluffs, 4 bedrooms, 1 full bath, 2 half baths, family room, full kitchen and dining. Pet friendly and fully furnished. Check availability and book your stay online today! The Minnesota Alliance of Local History Museums Conference has officially begun! We are honored to be the host city for the next two days.